Empty Nest: Does Slow and Steady Win the Race? Steady. The word makes me think solid, stable, safe. But it also makes me think regular, routine, boring. I suppose it depends on what you pair it with. For example, if I pair the word steady with things like a secure home, a dependable provider (whether it's me or someone else), an available partner, a full bank account, good health, and the like then I think solid, safe, stable, etc. However, if I pair steady with things such as chores, daily grind, meal prep, laundry, work, any obligatory act that has to be done daily or weekly I think more regular, routine, dull, boring, get-it-over-with. But then I look at how those things are connected- being a dependable provider means working every day and having good health requires the right foods and a regular routine of some form of exercise. Why is it the dull, boring things make the stable, safe things possible? It's all in our perspective. If we want safe, stable, and solid we're going to have to work for it and that's that. So, how do we do this with a more positive attitude? I thought about this and I recall a few things my grandmother did as she moved through her days in a positive way. Sing. Yep, or hum, or put some music on. No matter what I'm doing music makes it better even if I already love the activity. My grandmother was always humming and singing as she made her way through her daily chores. She always sang hymns, all of which are still my favorites. Change the way you think about what you're doing and take your time doing it. Grandmother never dreaded doing the dishes or dusting the furniture because she thought of it more as being grateful to have dishes to wash and furniture to dust. My granddaddy owned the local dry cleaners and every Tuesday was the day he took their linens and such down to be laundered. Grandmother did not dread Tuesdays. She was grateful not to have to wash them herself. Grandmother never rushed through a task to get it over with. She took her time and did it right. Save your favorite things for later. Grandmother always got the chores completed first and saved going out and meetings (Garden Club and Circle) or watching her 'stories' for the afternoon. Maybe that's why it was so easy for her to sing her way through the chores. Don't wait for someone else to help you, just do what needs to be done. And don't judge them for not stepping in and helping. Grandmother did what needed to be done without the expectation that anyone else would either help her or do it for her. When I was there, I did help her and she appreciated it but never expected it. Don't waste your time on futile exploits. Everything had a purpose with Grandmother or it was a waste of time. Even sitting and visiting with a friend meant something important to her. Take that annual vacation. We all went to the beach for a week's vacation every summer. We stayed at the same beach house and had the most wonderful time every year. On the weekends, we might just ride up to the mountains for the day or a weekend. Regardless, Grandmother and Granddaddy took the time to get away and relax and they took us with them. Pamper yourself. Grandmother's idea of pampering herself was having her hair done weekly. It was the one thing she did for herself and it made her feel good. They also went out to eat every Saturday night to the fish camp and took us with them. Such simple little things but they made such a difference. Don't concern yourself with material things. Grandmother did not concern herself with material things but she did take care of what she had. Not that she didn't appreciate or have nice things but she would have been fine without them. Material possessions were not even close to her focus. She did take great care of what she had. Such care that they never had to replace anything until it was worn out. Take nothing for granted. Grandmother took nothing for granted. She appreciated everything she had, took care of her home and her family, and took time to spend with others. Reach out to others. Grandmother always took the time to lift up others and encourage them but she took no crap from anyone. She stuck up for herself but she'd stick up for you, too. She also stood up for what was right. She'd give you anything you needed without expectation of return and she'd always tell you how valuable you were as a person. No need to wonder when you were around Grandmother. Ok, my time ran out waaaaay back there somewhere before I started the list. Oops. I had no idea where the word, steady was going to take. Now, I do. Ha! 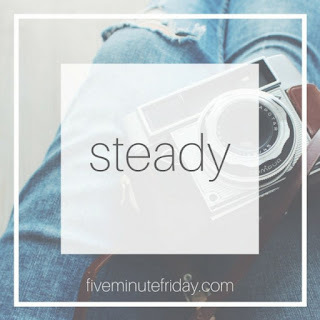 The prompt this week is STEADY. Yes. I do think that slow and steady wins the race. In our fast-paced, hyper-connected daily atmosphere, it's easy to be distracted and lose focus because so many bright & shiny distractions compete for our attention. But, we have a choice to focus on positive and meaningful activities and pursuits if we decide to choose wisely. Great post -- I have fond memories of spending days with my grandmother when I was a child (in the 1950's), and her routines were similar to those you describe from your own grandmother. It would be so wonderful to time-travel back to one of those cozy & fun days with grandma. I think our grandmothers had this all figured out. I never saw her rush through a single thing nor complain. She appreciated each moment and the task at hand. It would be wonderful to time travel back. If you ever figure out how to do that, let me know. :) Thank you! Your grandmother certainly was a wise woman and I wonder where we went wrong sometimes. So simple yet she made the most of her life. I like to leave things I like until later and singing is such a lovely way to go about your daily chores. Thanks so much for linking up with us at #overthemoon. I've shared on social media. Have a great week and look forward to you link up next week. She really was. I've never known anyone as wise as she was. I save the things I like until later, too. I guess I got that from her. Thank you for hosting and sharing #overthemoon. Hi there! 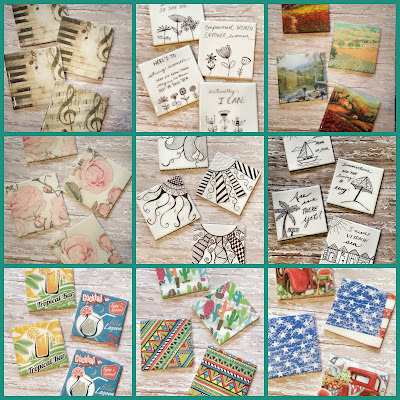 I just wanted to let you know that I have chosen your post as my Favourite for this week's Over the Moon Link Party. I hope you link up with us next week! Have a great weekend! What?! That's so awesome! Thank you so much! I agree with your other readers. Your grandmother was a very wise woman indeed. Thanks for sharing her tips #BloggingGrandmothersLinkParty ! I think our grandmothers lived in an age where slow and steady and appreciating what they had was the norm. Now it's all hustle and bustle and competition and keeping up with the Joneses. We can certainly take a leaf out of that previous era and slow down a little and commit to doing things well and doing them with a grateful heart. You have a point there. I have finally reached the age where slowing down to appreciate the moments makes way more sense. Thank you! As I've mentioned before, your grandmother was very wise. Thanks for sharing at #BloggingGrandmothersLinkParty. Have a great week! I do appreciate that about her, along with many other qualities. :) Thank you for commenting and hosting! I appreciate this wisdom. I had forgotten about my mom and grandmother working in the morning, then watching their 'stories' in the afternoon over lunch and then taking a nap. Pleasant memories. I am jumping into summer cleaning this week. Will remember to revisit your post for another look at this good advice. Yes, pleasant memories for sure. :) I've been summer cleaning as well and discovered it's going to take more than summer to get it done. LOL Thank you so much! Loved this. I just hope my grandchildren will have warm memories of me as I have of my grandmother. My grands loved her afternoon TV while she ironed or prepared what they called supper. Great memories. Thanks for sharing at #BloggingGrandmothersLinkParty. I hope mine do, too. Mine called the evening meal supper, too and the mid-day meal was dinner. They were raised on farms so the big meal was in the middle of the day. Thanks for commenting and hosting!